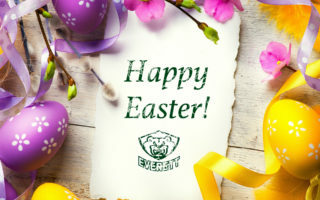 EVERETT, Wash. – A 39-save outing from Silvertips goaltender Dustin Wolf along with a multi-point night and shootout goal for Silvertips captain Connor Dewar lifted the Everett Silvertips over the Portland Winterhawks, 3-2, in a three-round shootout in front of 3,346 fans at A.O.T.W. Arena on Wednesday night. Dewar and forward Riley Sutter’s shootout goals were tonight’s deciding factor in a game that totaled 84 shots on net in 65 minutes of play. Dewar extended his point streak to 11 games with a first period power play goal, and Kindopp added another with the Tips going 2-of-2 in the first 20 minutes. UP NEXT: The U.S. Division-leading Silvertips will rematch the Portland Winterhawks on Friday at Memorial Coliseum, 7:00 in Portland (1380 AM / 95.3 FM / Tips App / WHL Live). 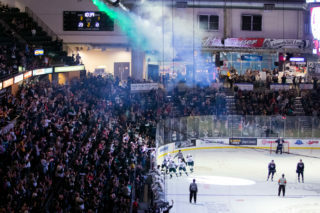 The Tips return home against Vancouver on Saturday, a battle between the top two teams in the Western Conference, at 7:05 p.m. Tickets are available at www.everettsilvertips.com/tickets. The game began with a crosscheck called at 1:46 on Portland forward Reece Newkirk, to set up a Silvertip power play goal at 2:27. 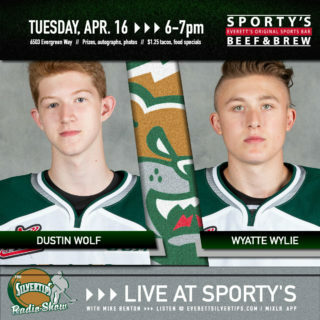 Silvertips defenseman Jake Christiansen and Wyatte Wylie set up Connor Dewar with a wrist shot from the right circle that beat Portland goaltender Shane Farkas blocker side. Import-forward Joachim Blichfeld was hauled for slashing at 11:18, which set up another Silvertips power play goal. Everett forward Bryce Kindopp found the net at 12:25 off a bouncing puck, rebounded off the boards behind the net, with assists from Dewar and Sutter. The Winterhawks outshot the Silvertips, 18-15, in the second period, as the Winterhawks offensive pressure continued into the third. The Winterhawks opened the third with two goals scored within 41 seconds of each other. Forward Reece Newkirk cut the Silvertips lead to 2-1 at 3:14 off assists from forward Jaydon Dureau and forward Seth Jarvis. Forward Ryan Hughes tied the game at 3:55 with a snipe off a pass from Vegas prospect Cody Class and defenseman Clay Hanus. 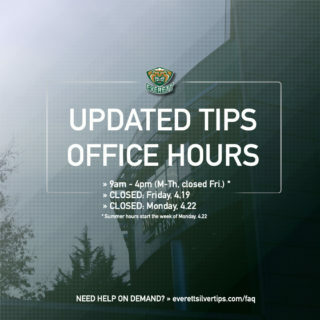 In overtime, the Silvertips feasted on opportunities as they put up four shots compared to Portland’s one, yet no goals were scored in the extra period. In the first round of the shootout, Dewar sniped Portland goaltender Shane Farkas blocker side. Portland’s Blichfeld matched Dewar with a goal of his own. In the second round, both Everett forward Sean Richards and Glass were denied from their opposing goaltenders. In round three, Sutter beat Farkas with a wrister blocker side and Portland’s Newkirk came up short with a huge pad save from Wolf. 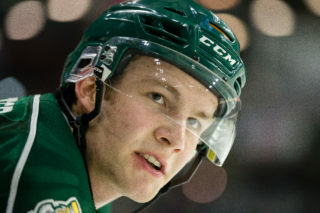 NOTES: Silvertips scratches include Ronan Seeley, Akash Bains, Peter Melcher and Bronson Sharp … Winterhawks scratches include Dade Nolan, Nick Perna and Haydn Delorme … Silvertips went two-for-three with the man advantage … the Silvertips have won nine of their last ten games and are now 3-1-0-0 head-to-head against Portland.